Testing the Balun with 200 Ohms and an Analyser. Looks good to me! Baluns have always been a bit of a homebrew boogeyman to me, mainly due do what appeared to be some sort of magical winding technique around a toroid. However, given the prices of baluns these days seems to range from $60 AUD upwards, given I have all the parts already at home to make one (“free”), I decided to bite the bullet and learn how to make one. I’m not going to bore you with the details on how a balun works here, other than to say I think they are useful for connecting coax to antennas. Ladder line, while more efficient, doesn’t have a very good use-case for my applications and good quality ladder line is also expensive and difficult to obtain compared to the plenty of coax I already have available to me. Shout out to VK6YF whose diagrams for the 4:1 Ruthroff voltage balun were what I used. Some people will be quick to tell me that it was odd to make a 4:1 balun when I am not using ladder line – I agree (and in hindsight should have made a 1:1 balun), but this was about learning how to make a balun. You can imagine my surprise after being having my build peer reviewed by my good friend Murray that other than a dry joint that was soon fixed, the balun actually worked! to put this in context, two previous attempts at building a balun had resulted in wildly varying SWR and resistive load that on the whole didn’t look much better than just using a piece of wire. Anyway, now that I know I can build them, I will obtain another jiffy box to build a 1:1 balun for use with my upcoming portable dipole! 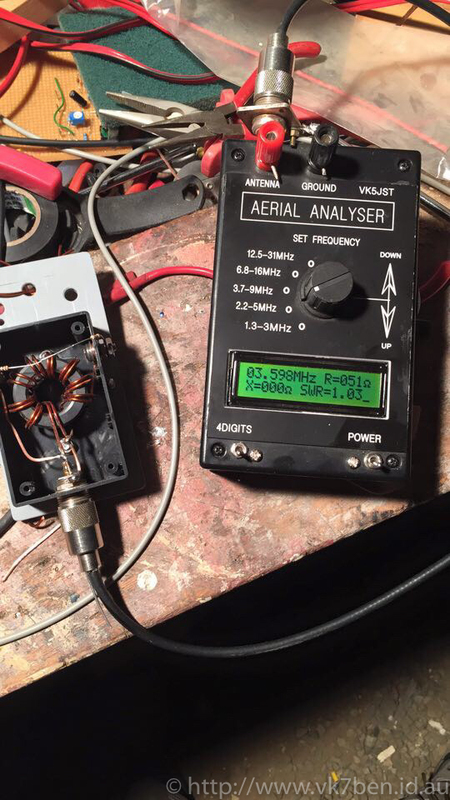 New HF Antenna for Home – an OCF Windom!